We've always loved supporting and championing local design in DCA shop, from stocking work by graduates of Duncan of Jordanstone College of Art and Design to collaborating with Scottish design studio Fun Makes Good on our DCA merchandise range. 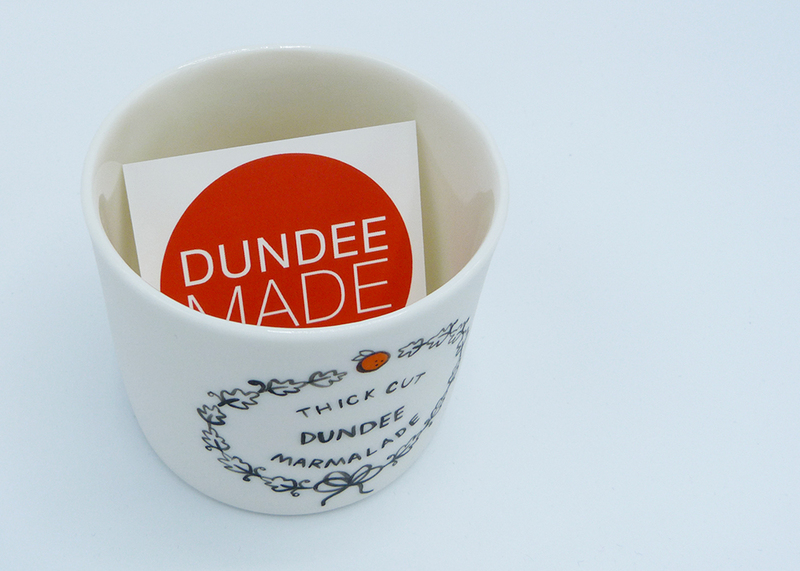 Now we're making it even easier to spot the work of local designers and makers on our shelves with Dundee Made. Our new bright red logo will sit beside products that have been designed and/or made right here in Dundee. Whether you're new to the city and looking for a special souvenir or you want to find the perfect gift with a local connection, we're here to help. Taking her inspiration from the forests, landscapes and lochs that surround the Scottish countryside, Elizabeth Armour is a jeweller and printmaker who uses 3D technology in a playful way alongside traditional hand-making skills in precious metals and relief printing. 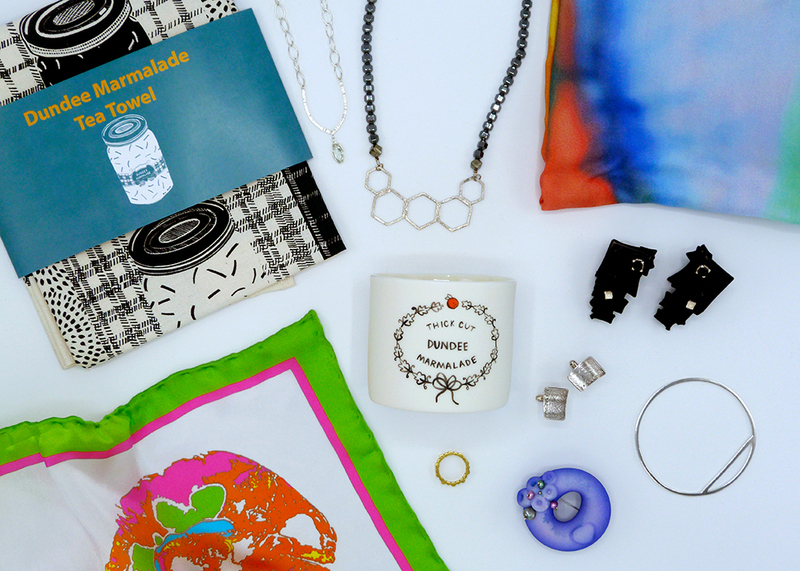 Based in Fife and creating work in DCA Print Studio, designer Kirsty Stevens uses her diagnosis of Multiple Sclerosis as inspiration for jewellery, prints, stationery, homeware and scarves. Find out more about Kirsty's work in our Q&A. Born in Scotland and based in Dundee, Joanna Craig uses her own drawings and paintings to create patterns which are then printed onto wearable silk scarves. Based in Wasps studios in Dundee, Genna Delaney produces jewellery using a mix of traditional silversmithing techniques and new technologies such as 3D printing. We recently spoke to her about her love of trying different processes in our Q&A. Using precious metals and gemstones, Scarlett Erskine creates high quality and uniquely textured jewellery in her Dundee studio. A graduate from Duncan of Jordanstone College of Art and Design and the Vanilla Ink programme, Lucie Hunter is a Dundee-based jeweller who creates work inspired by the Scottish landscape. Designer and illustrator Louise Kirby's Dundee Delights collection celebrates some of the delicious delicacies and iconic places in and around the city. With a background in illustration, designer Steph Liddle creates contemporary ceramic jewellery and homeware using bold patterns and minimal shapes. Read our Q&A to find out more about what she gets up to in her Dundee studio. Inspired by textiles, Dundee based designer Nicola Morrison creates jewellery by roll printing silver and gold to create different textures for her collection of earrings, bangles, cufflinks, neckpieces and brooches. Taking inspiration from architecture and urban environments, Kirsten Manzi focuses on shape and line to create structural silver jewellery. Originally from Portugal, jewellery designer Filipa Oliveira is now based in Dundee, where she uses the traditional technique of filigree to make innovative and contemporary pieces. 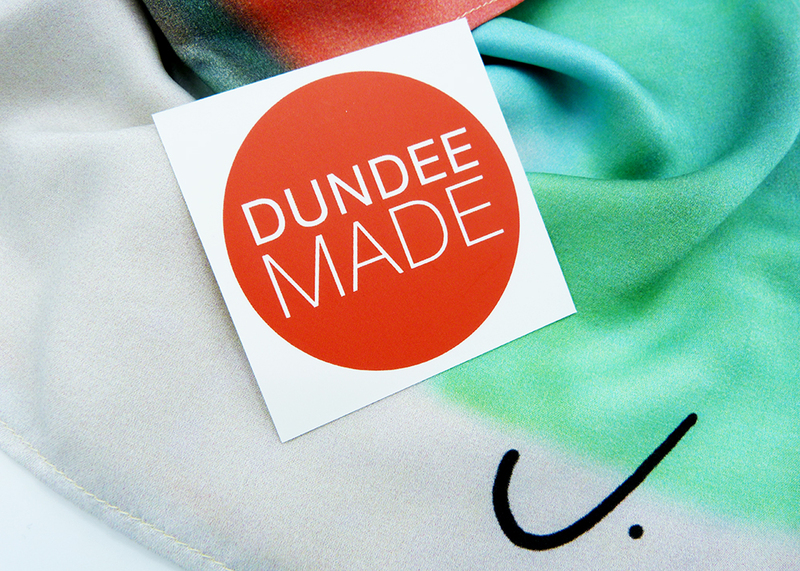 Keep your eyes peeled for the logo in store and watch out for a Dundee Made category coming to our online shop soon. If you're a Dundee designer or even if you're from further afield, you might be interested in applying for CRAFTED, our festive market which will take place in DCA on Sat 1 December.